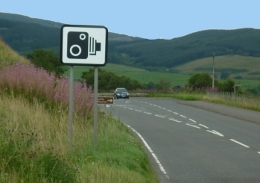 If you already have 9 points on your licence, or if it’s a high speed, you will be prosecuted for your speeding offence in a Scottish Justice of the Peace Court (a “JP Court”). For those who are convicted, the JP court can impose fines of up to £1000 (£2500 on a motorway). You’ll also get points on your licence. How many depends on the speed, but for any speeding offence you won’t get less than 3, and you won’t get more than 6. Once you have “tott ed up” 12 points on your licence you will be banned for 6 months. If it’s a very high speed, the court won’t put points on your licence but will impose a ban instead. 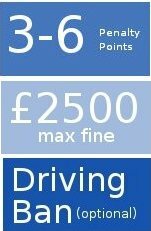 ot risk having 6 live points on their licence which could lead to a ban for the next offence. The penalties for speeding offences are even tougher on new drivers. If you have obtained your licence within the last two years, then you will be banned once you have 6 points (not 12) on your licence. You will also be fined. You will be required to sit the test again. For some people, getting convicted for speeding offences in Scotland can result in disqualification: this can have a devastating effect on their personal and professional life. If losing your licence would lead you (or someone who relies on you to drive) to suffer “exceptional hardship” then we can tell the court this. In these cases, the court has the discretion to let you keep driving even with twelve points on your licence. “Getting a letter through to attend court is quite a shock to the system. Having never been in this position before I contacted Joe who explained everything and took care of dealing with things. The professional service given was first class, and took a great weight off my shoulders. “I would like to take this opportunity to thank everyone at Scottish Driving Law for the excellent service they had provided me for my speeding case. “After being caught speeding and being caught going over 100mph, I was extremely concerned about how I could keep my job because driving is an essential part of my work. Joe’s professionalism shone throughout the process and he was second to none for me. He always answered my questions courteously and in such a way that I found easy to understand and for that I cannot thank him enough. His attention to my case throughout my ordeal made it as painless as possible for me. “Having being caught and pulled over by the police for speeding doing over 100mph on the motorway, I was certain I was getting a ban. I researched into speeding solicitors as I’d never been in the position before. Top Google search was Scottish Driving Law. I looked through the testimonials and made contact via the phone. Joe called back within minutes and talked me through everything step by step. I’d never needed to use a solicitor for anything before and his all inclusive and very reasonable fee was comforting! “After being charged with speeding at at 91mph on a single carriage road with a 60mph speed limit, I was convinced that I was facing a ban. “I engaged the services of Scottish Driving Law, and must say that Joe MacPherson put my mind at rest with his knowledge of the system, and carrying out the groundwork and representing me at Inverness Peace courts in my absence. “The result of 5 points and a £300 fine was much better than the ban I was expecting. “I would also like to comment on the good value offered for their services. “Joe kept regular contact on the lead up to the hearing, and gave extra attention to each piece of information I provided to ensure a good outcome. “Joe took some simple information and turned it into a plea on my behalf. I expected a hefty fine and possibly a ban due to the nature of the offence. Joe was able to ensure that I received a minor fine and reduced points for the offence. “My case at Dumfries just concluded today and Mr Joseph Macpherson appeared on behalf of me as I have been on holiday. I am glad to say that the services I have received been really excellent and communication was very nice as Mr Macpherson kept me informed about my case via email. I am very happy with the result – one charge against me was dropped and for the other, the fine is much lower than what I expected. I would happily recommend this firm services to my friends as Mr Macpherson has been really professional handling my case. Joe , thank you, the service was amazing, first class. Best choice was to go to you Joe so happy i did, you saved my future. Very grateful – you were straightforward and got results quick and you were very professional. Great Dumfries solicitor. Anyone with an issue with driving matters I urge you to use their services especially Joe. You won’t be disappointed – I highly recommend their services, thanks again Joe.